The Washington Post reports that Diane Rehm—the 79-year-old host of WAMU’s The Diane Rehm Show—will be retiring after the 2016 election. The station would like her to continue, but Rehm has occasionally expressed weariness with the daily routine of preparing her program, said people briefed on the discussion, who spoke anonymously because no announcements or firm decisions have been made. They said that the decision about leaving the air is up to Rehm. “My thinking is that I’ll stay on the air until the election because I really want to see how this will go,” Rehm said later. “My feeling is, I have a number of ideas and I’m perfectly happy doing something different...where I’m not forced to get up at 5 a.m. every morning to prepare for a show. I’ve been doing that for 37 years. Maybe I’ll get to sleep until 7 or 7:30 a.m., like other people do.” Sounds like a good idea to me! Rehm’s career has been—to use a hackneyed term—inspirational. She started at WAMU in 1973 as a volunteer on The Home Show. In an industry (and world) that was even less friendly to women than it is now, Arab-American Rehm had plenty going against her: she didn’t have a college degree, was nearing 40, and was also raising two kids. After a few promotions, six years later she took over a program called Kaledioscope, which was renamed The Diane Rehm Show in 1986 (Tagline: “One of her guests is always you”). The show is now distributed by NPR at hundreds of stations around the country, with millions listening each day. Rehm has also written three books: her memoir Finding My Voice, a book about marriage co-written with her late husband John, and a book about her dog Maxie. She’s won a Peabody and a National Humanities Medal. Public radio has a notably limited number of woman voices on the air (or in leadership positions), and Rehm’s consistency has made a huge impact, even as she’s suffered from the vocal condition spasmodic dysphonia over the past several years. After her husband’s death, she also became an advocate for right-to-die legislation; in February she’ll release a fourth book about the topic. WAMU said they will announce Rehm’s “full transition plan” later. Despite her exit, it’s clear her legacy lives on: though it’s early still, only women have been named as potential successors to her chair. 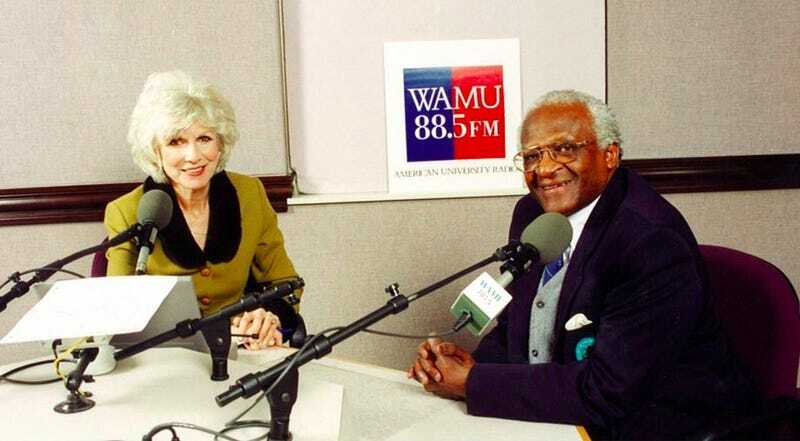 Image of Rehm in 1998 with Desmond Tutu via WAMU.